One of the greatest challenges of commercial roofing is being prepared for any type of weather at any given moment. Because there is cooler weather coming to Perth, it’s important to ensure your roof is buttoned up and prepared for the drop in temperatures. Here are some items to put on your maintenance checklist before the colder weather arrives. Inspect gutters and spouts and diagnose any flow issues. Clear out any debris. Make sure all drains are prepared to handle a heavy downpour. If there is any mechanical equipment on the roof, ensure it is waterproofed and protected from the effects of cold weather. Inspect seals around equipment for cracking or leaks. Re-seal if necessary. Closely examine the levelness of the roof and make note of any places where water has been pooling. Check for evidence of moisture damage if water is pooling. If any roofing materials are bubbling or coming loose, they should be repaired right away. Sealants used to seal roofing materials are out in the sun every day, vulnerable to drying and cracking. Make sure to inspect caulking and other sealants for cracking to prevent ceiling leaks. Wind and other inclement weather can cause a low hanging branch on a tree to fall on a roof and compromise its structural integrity. Before the rainy season arrives, check your building’s surrounding to ensure your roof is protected. Ballast is the loose gravel on a rooftop. It provides added support to the membrane, or the piece of material that floors the rooftop. To ensure a commercial rooftop is secure and protected, ensure ballast is evenly distributed across the surface. When temperatures drop off, the material used in rooftop membranes can harden and become less flexible. This can make it more vulnerable to tearing. Be gentle when walking on rooftops in colder temperatures. During colder weather, heating will be in higher demand. While checking the condition of your roof, make sure HVAC units are running well. 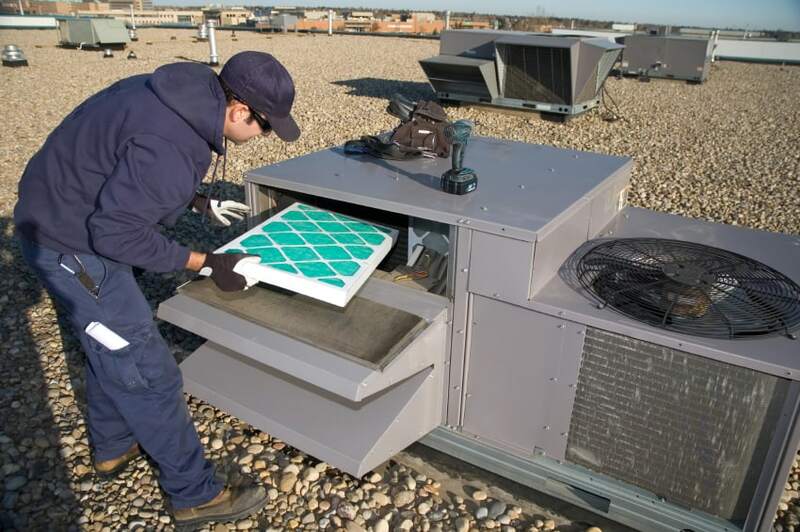 Preventative maintenance can help building operators skip the headache of an overheating HVAC unit during the winter month. Roof health can be diagnosed from outside and inside the building. Make sure to keep a close eye on any leaks, cracks, or discolorations in the interior. If the leak cannot be located on the rooftop, you might want to call a professional. Before your roof is buttoned up for the winter, it is important to know the copings are 100% prepared for the oncoming weather. Examine coping joints carefully and inspect the caulking before checking this item off your list. Roofing companies should build commercial roofs to withstand the elements in any season. But, even the best roofing jobs require upkeep to provide maximum protection. With this preventative maintenance checklist, you can make sure your commercial roofing in Perth is prepared for the winter weather.